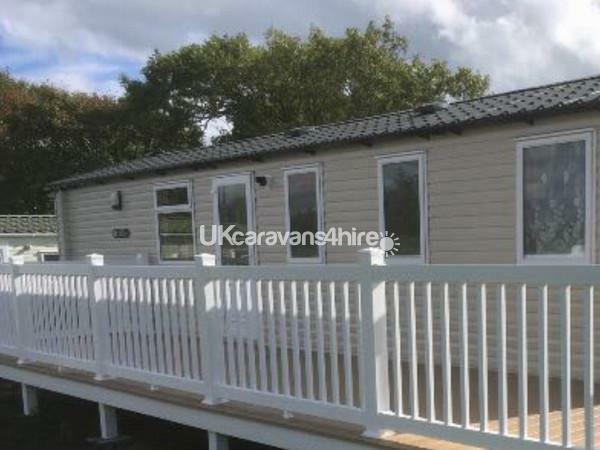 Fully double-glazed with central heating, to complement this unit it has fitted a decking patio with table, chairs were you could sit, relax, and enjoy the conditions/ views. 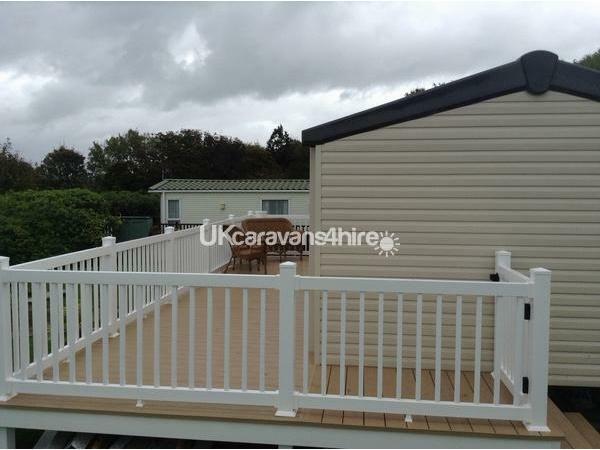 The decking is gated/ safe for the children. 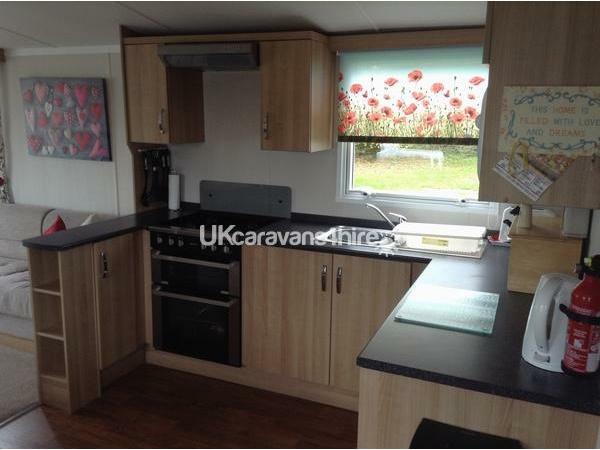 Outside the Caravan there is a car parking space for one car, a grassed area. 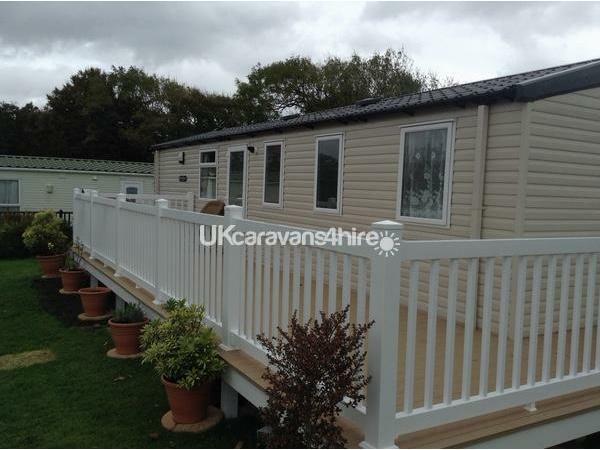 The caravan is situated in quiet and peaceful area on this vibrant holiday park. 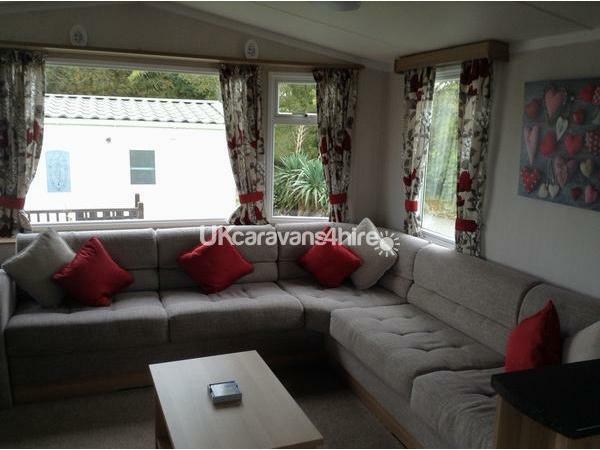 The lounge area is a great size, spacious giving a really relaxing feel, fitted with a glass flame effect fire, a 32-inch flat screen television, DVD Player. The dinning area forms part of the open living area with fixed seating table and stools. 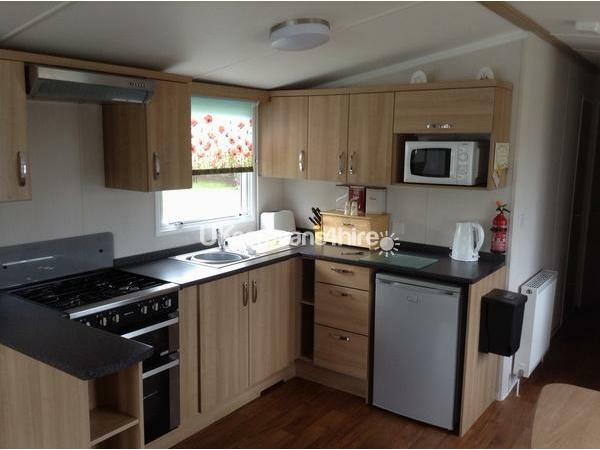 The kitchen is fully equipped lots of storage space and has every thing you will need during your stay, including a full size gas oven, grill, microwave, kettle, toaster, fridge and all the crockery, glasses, utensils in order for you to cater for your family. 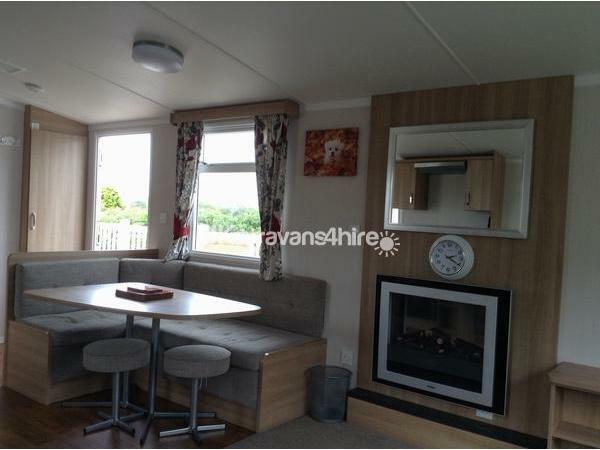 The Caravan has three bedrooms and can sleep maximum of 6 people. Bedroom 2, 2 x singe beds, fitted wardrobe. Bedroom 3 2 x single beds fitted wardrobe. Pillows/Duvet are provided you only have to bring your own bed linen and towels. 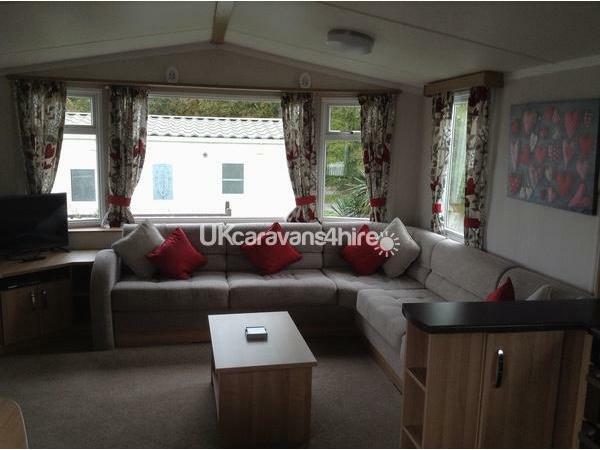 A £100.00 deposit (Non Refundable) is required to secure a booking. Balance to be paid 8 weeks prior to arrival date along with an additional £75.00 security bond payment which is refunded within two weeks of departure following a satisfactory inspection of the unit after your holiday and your booking conditions have been met. Prices does not include Fun Works Passes, these can be purchased (if required) on day of arrival at Reception. The Site has several new development NOW OPEN these include: Dragon Lake Activity Village, Coast House Bar and Grill, Coastal Clubhouse Sports Snug Country Pub, All Weather Terrace.Pizza Deck Stone watch yours being prepared and cooked in traditional wood burner. Whatever you're in the mood for if you want peace and quite or lively entertainment on the park, there is a huge choice of safe and friendly options available for the family to enjoy. 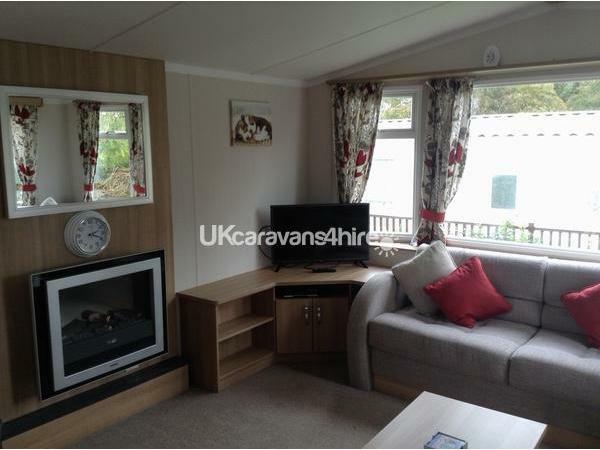 The site is situated in the beautiful North Wales Coast and the Llyn Peninsula that has lots of lovely little beaches and attractions to visit including the lovely whistling sands. Additional Info: This is a great holiday park catering for all ages a truly special place to come and build family memories. There are outdoor weather sports facilities,football, boating lake, Bike & Kart hire, Ranger activities, adventure golf, segways hire, archery & fencing coaching, roller blading, children's play area ,gardens or why not climb up into the treetops and have a go on the Aerial Adventure high ropes course. There is a show bars with lots of entertainment with Bingo, singers etc. Restaurant & Bar, Burger King, Cook’s Fish & Chips, Papa John Pizza, Starbucks and a supermarket for all your essentials. A fantastic Indoor pool for the family to enjoy with three flumes slides, multi- lane slide, bubble pool. Lazy river and wave pool play area for the young children, plus a lane pool for those wanting to just swim. Millies cookies Cafe, gardens to relax in. NOW OPEN the sites new developments include.Dragon Lakes Activity Village, The coast House Bar and Grill, Coastal Clubhouse Sports Pub HMS Glendower. Boat rides,sand pits multi sports area, climbing walls,rope courses, bunge,trampoline Childrens 4x4 safari driving experience. Cakery,Pizza Deck.